Fresh fruit, including fruit from local farmers, delivered straight to your office or your home, including box (basket)! 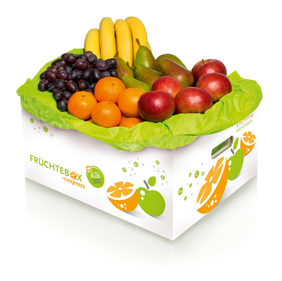 Fruitsbox Express works together with Swiss farmers to deliver fresh fruit boxes – straight to your office or your home, anywhere in Switzerland and Liechtenstein. The fruit box is suitable for both large companies and SMEs as well as households. Why a fruit box? Simple: motivation for staff and customers with vitamins to keep them healthy and full of energy in the workplace. The best fruit, including fruit from local farmers, is delivered straight to your office or your home, helping you to save a great deal of time, money and stress. Order the fruit box (fruit basket) on a subscription basis (delivery every Monday, for example). The subscription can be changed or cancelled at any time. The fruit box is also available as an single order or as a special gift with a gift card – place your trail order here.